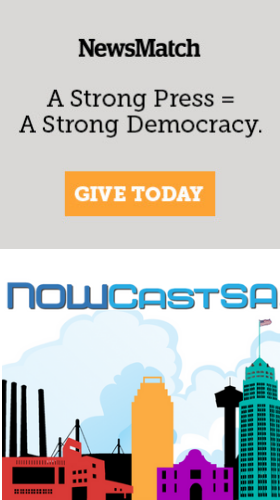 In nearly four decades as an architecture and urban planning critic in San Antonio, I have seen some good plans and some bad plans. Never have I seen anything as destructive, wasteful and historically insensitive as the Alamo Plaza Master Plan. It deserves a place of honor all its own in the trash bin. The plan and all of its faults flow from a fundamental conceptual error. It seeks to limit the northern portion of Alamo Plaza, the portion with the greatest civic resonance, to a single function – commemoration of a specific historical event – to the exclusion of all the other functions that the plaza historically served as a major venue for San Antonio’s civic, commercial and cultural life. The public space that we now call Alamo Plaza served most of these manifold urban functions throughout its history, from its formation in the 18th century as the courtyard of Mission San Antonio de Valero, through its expansion southward in the decades following the 1836 battle, and into the present. The only significant urban function that was denied to that public space prior to 1836 was its use as a passage from one part of the city to another; we can be thankful to General Antonio López de Santa Anna for demolishing large sections of the original mission wall, thus enabling the plaza to add “transportation hub” to its repertoire. Historically, Alamo Plaza has been home to a major concentration of home-grown retail stores (Frank Bros., Hutchins Brothers, Joske’s, Lauterstein’s), many of whose owner families were prominent in San Antonio’s cultural life. The city’s Grand Opera House and at least two other theaters were located on Alamo Plaza. The city’s biggest annual event, Fiesta San Antonio, began in Alamo Plaza with the first Battle of Flowers in 1891. The first Luminaria, our annual arts celebration, was presented in Alamo Plaza and nearby streets. The Woolworth store in Alamo Plaza was the site of the first lunch counter in a major Southern city to be successfully and peaceably integrated. The plaza has been the site of political rallies and protests. It has welcomed street preachers, raspa vendors, lovers and beggars. Alamo Plaza has been a special place in San Antonio’s urban fabric, but it has also been fully integrated into that urban fabric. 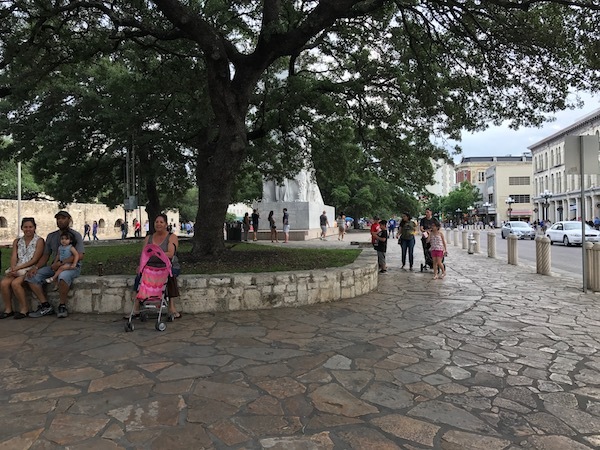 By foot, car, bus and bike, San Antonians have passed through Alamo Plaza in their daily travels and thereby sealed their bond with their city. It is essential to Alamo Plaza’s historical reality that it is and has ever been a part of city life, not apart from city life. As a corollary, previous generations of San Antonians have understood the 1836 battle as a part of the flow of history, not apart from it. The master plan as proposed pretends to honor history by denying and disrespecting it. 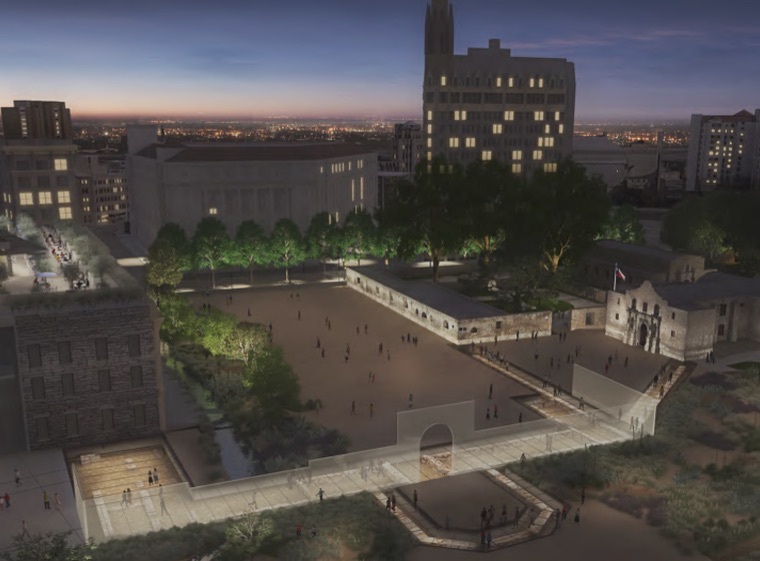 Moreover, the plan’s proposed removal of the Alamo Cenotaph and its nearby trees would convert a vibrant urban place into a glass-enclosed “reverential” lacuna – “reverential” apparently being defined as controlled, sterile, boring, sun-baked and useless. And a damned nuisance, to boot. 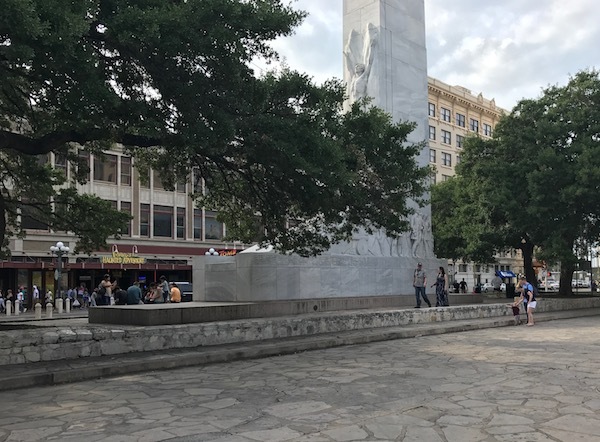 If closing Alamo Plaza to vehicular traffic is a merely stupid idea, the notion of blocking pedestrian access from Houston Street and allowing only one point of entry on the south is a spectacular example of urban-planning malfeasance. Worse yet, the plan’s proposal to eliminate First Amendment protections within the plaza is tantamount to high treason. If Alamo Plaza does not retain its traditional status as a public forum, why did the Alamo defenders give their lives? The only other available answer is that they fought and died to have Texas annexed to the Union as a slave state – not exactly a noble cause. The plan has merit in its provision of resources for a conservation program to stop the physical deterioration of the surviving remnants of the 18th-century mission. The proposal to interpret the original south wall and its entry gate with structural glass is intriguing, although that feature should be greatly reduced in scope in order to leave pedestrian movement unimpeded. In nearly every other particular, the Alamo Plaza Master Plan is an unmitigated disaster and a colossal waste of money. If executed, it would destroy the civic heart of the city. City Council should reject it out of hand. The Alamo Master Plan goes before City Council on May 11. While our city decision-makers spend public funds to move the building blocks around and around downtown (Alamo Plaza, the Convention Center, Hemisfair, etc.) we have residents living in poverty conditions in many areas of our city. It's shameful.